Hope you all had a restful weekend and some Mother's Day pampering if you're a mom! abundance of delicious food, requisite indulging and inevitable Monday morning regret! I was polite it took everything I had and didn't ask or sneak any photos for you...so sorry! Do you have a favorite go-to hostess gift? How charming!!! I like to bring a candle or flowers. Love what you did. Sure it was appreciated. The plant gift looks gorgeous Pam, so simple and elegant. I'll have one of those when you pop over for lunch please. Hope you can join us for our fab Cake Stand Giveaway! I'm always happy when someone brings me wine ;) Love the plant too though! You are the best gift giver! It's all in the presentation, and you do that well. what a perfect gift. I love all these ideas! I take a bottle of wine most often. I hope you got pampered on Mothers Day. these are simple and sweet ideas- just my style! I love your creative hostess gift ideas! Glad to hear you had some fun this weekend and enjoyed Mama's Day! Great idea!...love them all and where did you purchase the wine bottle holder?...I will have to use your great ideas!...I also went to a dinner party Saturday and the wine bottle was certainly not "dressed" like yours...love that idea!..glad you had a great Mother's Day weekend! I buy tons of bars of lavender soap when I go to Provence...store them away and give as hostess gifts! The bonus is that they smell so wonderful, even when wrapped up! Consider yourself invited! I'll be serving Starbucks and water! Sounds like you had a great weekend Pam. I like the carry tote at the top that you took to your friends. Great idea! These are all wonderful ideas. 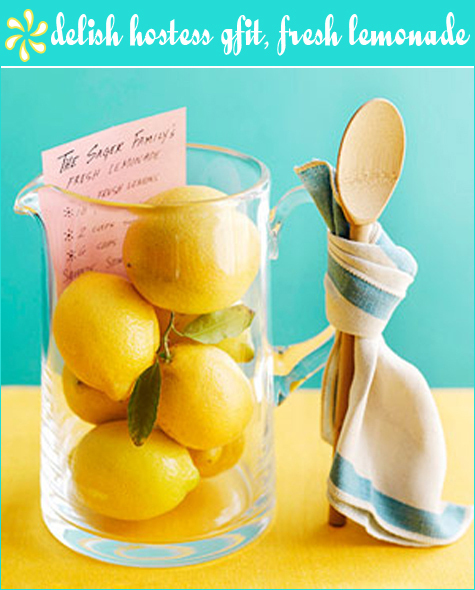 That lemon/pitcher is so fun now that summer is here! Lovely hostess gifts! They have a lot of thought and care in them! Wine gift to the wine lover and a floral to one who appreciates gardening. How great! I love each idea. The stock in kraft paper and twine, that's gorgeous! I usually bring etsy handmade gifts, Anthropologie fun things or flowers from our garden. We loved your delicious cookies, perfectly baked and wrapped beautifully on our trip home from Colorado. You are such a generous gift giver, Pam! Such lovely ideas. I love bringing potted herbs to friends' homes. What a sweet gift. Haha I was at one of my clients vacation homes a few weeks ago and had to keep repeating to myself in my head "you can't take photos for your blog. You can't take photos for your blog" easier said than done! The wine bottle holder just makes the gift! Would you please share where you found it? Thanks! Thanks everyone! The wicker wine holder came from TJ Maxx, it was $5.99 and the dish towel is Ikea .79 I buy them by the dozen and use them all the time, they're great to wrap food gifts, too. Sounds like a great evening Pam! Love the hostess gift idea. I love these ideas. I'm always hunting for a unique hostess gift. Thanks for the inspiration.